The Speckled Egg collection consists of 6 super cute Easter shades with adorable Easter inspired names containing tiny black glitter and larger black hex glitters just like speckled eggs. Photos and review after the jump! hippidy hop is an opaque plum purple that applies well but was a little difficult to get the large glitters onto the nail. 2 coats is pictured. egg-cellent is a pale pistachio green. It makes my hands look horribly red but it's a cute shade nonetheless and I'm still going to rock it haha. The formula is a little thin so I found 2 thin coats followed by a thicker 3rd coat did the trick. 3 coats is pictured. hop pink is my favourite from the collection and it's a gorgeous bright pink. It was the easiest to apply and 2 coats is pictured. blue bunny is bright robin egg blue and unfortunately it was the problem child of the collection! It was darn near impossible to get the large glitters onto the nail straight out of the bottle so I had to dab them. 3 coats is pictured. bunny bloom is a cute pastel pink that is a must for an Easter collection. 2 coats is pictured. hot cross fun is my second favourite from the collection and it's a pastel corn yellow. Formula was reasonable but I used 3 coats for opacity. 3 coats is pictured. Overall: Love love love!! Run not walk to get them while you can! Some of the formulas are a bit miss like blue bunny and egg-cellent however for the price you can't go wrong at all and the shades are just too adorable together. The polishes dry to a slightly matte finish and it's worth letting them dry thoroughly between coats so you don't get any bald spots. 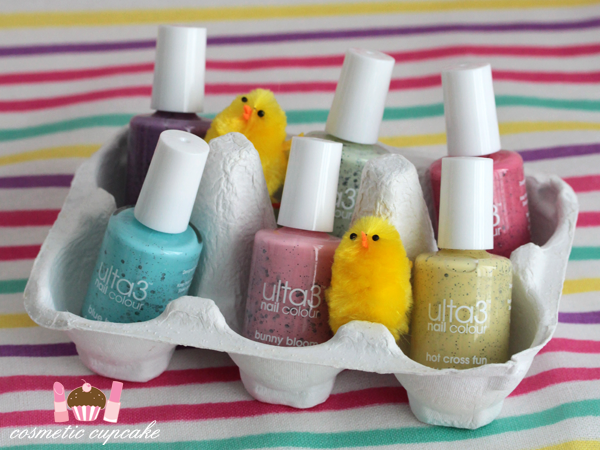 Details: The Ulta 3 Speckled Egg nail collection is available for a limited time from selected pharmacies for $3. Check out the Ulta 3 store locator for stockists! I found these at Soul Pattinsons Pharmacy at Pitt St Mall however when I went back about a week or so ago they were completely cleared out. I hope you're all having a lovely Easter if you celebrate and if you don't I hope you're enjoying the long weekend =) Thanks for looking as always!